The 16th season of the classic Doctor Who show was a bit harder to watch than the previous seasons. One of the hardest in a while. And that kind of surprised me. I first saw Doctor Who episodes on PBS back in the late 1970s and 1980s. In late 1982 or early 1983, I first saw The Hitchhiker's Guide to the Galaxy on PBS. I discovered it because I occasionally watched some of the shows the network carried, on GPTV (in Georgia, now GPB) and FPB (in Florida). And, though I can't be sure, I think I saw some Doctor Who episodes before I saw The Hitchhiker's Guide to the Galaxy. Certainly, though, around the time Hitchhiker's Guide aired, I was watching more on PBS, particularly GPTV. What's Hitchhiker's Guide got to do with Doctor Who you ask. Really, go ahead and ask. Oh, well, since you asked, it turns out that the new Script Editor for Doctor Who beginning with Season 16 was Douglas Adams, creator of the Hitchhiker's Guide to the Galaxy franchise. When I discovered that, I just knew I'd love Season 16 of Doctor Who. I didn't. Oh, I didn't hate it. But I didn't love it. It was, at best, Mostly Harmless. Maybe the problem I had with the season was K-9. I never did like that character. Or, maybe it's Tom Baker's habit of occasionally looking at the camera and laughing. I don't care for that kind of stuff. The season introduced a new character, Romana (Mary Tamm), as well as the new version of K-9, which looks to me like the same character. Romana was a Time Lord (Time Lady) from Gallifrey who was sent on a quest with The Doctor by the White Guardian. The White Guardian is ... heck, I don't know. I never could figure it out. Maybe it's supposed to be the Gallifrey version of God. 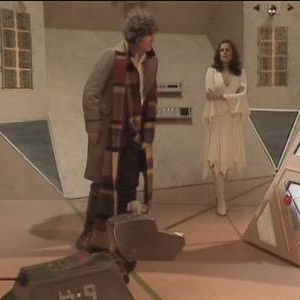 Anyway, the White Guardian sends The Doctor and Romana on a quest to secure the parts of the Key To Time, which is ... a MacGuffin, as far as I can tell. The Doctor and Romana spent the entire Season 16 searching for the thing because it was so important, and then, in order to keep it out of the hands of the Black Guardian, The Doctor scattered it back across space and time. Which is where it was to begin with. Tom Taker sported an injury for much of the season. He was bitten on the lip by a dog belonging to one of the guest actors in the first serial, The Ribos Operation (4 episodes). They covered it with makeup for the remaining day's shots, and wrote a rough landing into the next serial, The Pirate Planet (4 episodes), so that The Doctor would injure his mouth, creating a reason in the storyline for the wound. The series' 100th serial aired during the season. The Stones of Blood (4 episodes) was the milestone serial, and it aired during the show's 15th anniversary. The Androids of Tara (4 episodes) appears to have been based on The Prisoner of Zenda. There's a scene where, after he is told of the plan to have a look-alike, an android in this story, act as a decoy, The Doctor says, "It's been done before." The final serial of the season, The Armageddon Factor (6 episodes) introduced yet another renegade Time Lord. Drax knew The Doctor at the Academy, and knew his as Theta Sigma. The Doctor insisted on Drax not calling him by that name, but by "Doctor" instead. The serial concluded the season-long arc of The Doctor and Romana searching for the Key To Time, finding it, then dispersing the parts. Except for the last part, which was actually a person, the Princess Astra. Actress Lalla Ward, who later married Tom Baker, played Astra. She'd play another character in later seasons. With the dispersal, Princess Astra was restored. The Doctor installed a randomizing unit in the TARDIS, meaning he'd never know where he was heading, in order to avoid the Black Guardian, who was now after The Doctor, after the dispersal of the Key. And that pretty much wrapped up the first season with Douglas Adams as Script Editor. I expected more. Silly me. Maybe things will improve in Season 17. They will get better. 'City of death' is full of Douglas Adams wit. It also borrows a plot device from Kurt Vonnegut's 'Sirens of Titan'. A plot detail of 'City of Death' will also be borrowed in a Star Trek Next Generation episode. Dpuglas Adams also introduces Lala Ward to her future husband - after Tom Baker - the writer Richard Dawkins.